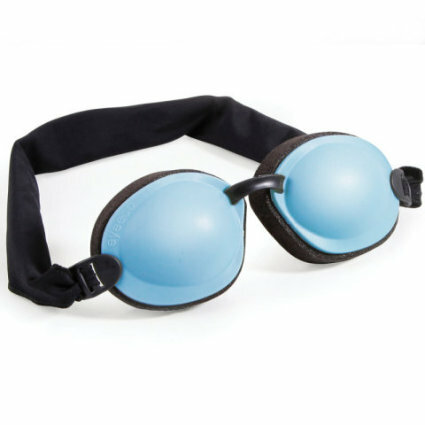 The goggles are actually part of the Dry Eye Relief Kit that also includes gel packs, which when warmed in a microwave and placed inside the goggles, stimulate tear production. Inserted into the goggles and worn for 20 to 15 minutes, the gels stimulate the meibomian glands that are located in the rim of our upper and lower eyelids and release oils necessary to moisturize the eyes. 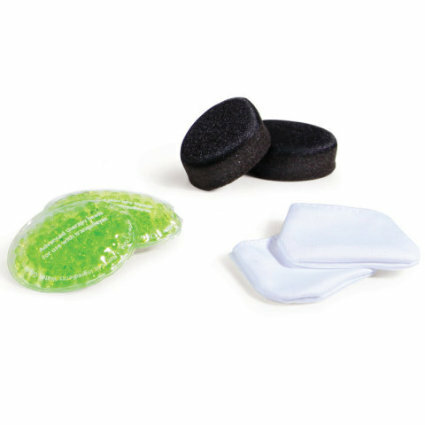 The foam inserts included in the Dry Eye Relief Kit can be soaked in warm or cool water, placed in the goggles and used over the eyes during sleep. The goggles form an impervious, 360° seal to prevent air. pollen, and dust from drying out the eye during sleep. Some persons suffer from lagophthalmos, an inability to fully close the eyelids that seriously affects lubrication of the eyes. By wearing the Dry Eye Relief goggles at night, those with lagophthalmos can limit their exposure to particles that cannot be washed away. The Dry Eye Relief Kit is sold by Hammacher Schlemmer. The gels can be heated up to 50 times and the foam inserts provide up to 60 uses; additional inserts are also sold by HS. PET Lights Could Be Your Next Pet Project!